So the moment has arrived. The Indiblog awards solicits your nominations for the First IndiBlog Awards 2003. Please add you nomination(s) using the comments links against each/any category. We know, you may have to click more than once if wish to add many blogs in different categries, but believe us it will be an worthwhile effort. Alternatively you can email us your nominations. From our earlier post you would notice that we have added two more categories on Best Hindi/Regional IndiBlog. Note: These are only "nominations", actual "voting" for each category based on these nominations would begin on December 1, 2003. Please nominate as many eligible/worthy IndiBlogs, you know of, this would add to the healthy competition. If a blog that you think should be nominated to a category has already been nominated by someone, perhaps there is no need to re-nominate it, just make a mental note and vote for that blog when the Polls begin. Also, try finding and nominating an eligible IndiBlog for a category which might have attracted lesser number of nominations or no nominations at all. For each category one blog will be treated as a single entry despite of multiple nominations. * IndiBlog in any Indian language except Hindi/English. # Being added based because no IndiBlog perhaps covers Music alone. So this category is for IndiBlogs that discuss Movies (Any language), Music and other art-forms such as Drama, Paintings, Poetry/Fiction. As far as our divya-drishti can see the effort has hardly generated any interest. Our gut-feeling tells us that the banana-effect has taken its toll, if its true, well, we can only say: bad luck of IndiBlogosphere. A point that we missed earlier and wish to jot here for reassurance is that the entire process of IndiBlog Awards would be democratic, with the automatic ballot machines and all ;) So every IndiBlogger (even non-Indians IndiBlog readers) would be eligible to suggest the rules, the categories for which blogs are to be nominated and finally, selecting the one that is unarguably the best in each category. The last phase would be implemented through a cookie based web-poll that would (hopefully) ensure that a voter votes only once for a chosen category. A word of reassurance again: We would have no say on the final selection process, that being automatic, even the poll software would not be hosted by us (infact we do not have any money to pay for hosting). We propose to complete the process of nominations by this month end so that the voting may be started in December first week. As you might have expected, the polls would close on December 31st and the winners would be announced as soon as the year 2004 ushers-in. To set the ball-rolling here are the categories we propose. Go ahead! Tell us if you wish to add more or strike out the ones given. Feel free to drop your comments here or better still, drop an email. This effort can only be successful with your feedback. We are also bloggers like you and were pained to bitter banana. Our view was, if bitterness can provoke, sweetness would kill. As we said earlier, what we have is an eye for appreciation. Those are multitude of pairs of eyes that belong to you fellow IndiBloggers. We hope you understand that we have nothing to gain from this effort. Lets utilise this opportunity to foster mutual appreciation among the IndiBloggers and recognize the talented from amongst us. Best Music IndiBlog: IndiBlog writing a lot or entirely dedicated to a musical cause. Best Sports IndiBlog: Given our madness over the sport we doubt it would be a blog on any other sport other than the Cricket. Best topical IndiBlog: IndiBlogs with a definite topic other than general/personal, music, politics, computers and technology. Best New Indiblog: IndiBlog started in the latter half if 2003 i.e. on or after July 1 2003. Lifetime achievement: IndiBloggers who have been blogging at least since January 1, 2002. 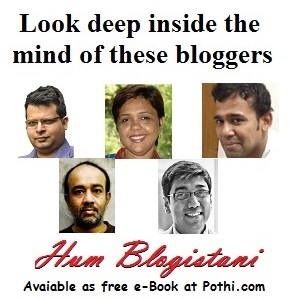 The number of Indian Bloggers is increasing by leaps and bounds. Don't take our word for it, just notice the ever-growing listings at Indian Webloggers list or the Kamat Blog Portal. The sheer amount of posts that these talented bloggers churn out everyday on a gamut of topics can make you feel dizzy. The quality of writing often lets you marvel at the literary talent this country has produced. We Indians are known for our tactful gift of gab. We have proven our mettle in all walks of life and we are perhaps the largest blogging community in the world too. So why the IndiBlog Awards, you ask. Well, aren't the above, reasons enough for a celebration? Agreed, these awards may well be just another awards but they are a celebration of the Indian Bloggers around the globe. And yes here we would only be praising and looking at the positive aspects about the Indian blogs, no pundit here to feed you bananas of crap wisdom. Suffice to say that the IndiBlog Awards has, what the Razzies don't, an eye for true appreciation. Now, the IndiBlog Awards may the based on the concept of the Bloggies but together we can add the Indian ethos to it. The awards, unlike the Bloggies, would not be able to give you anything apart from the praise and recognition you deserve but let's hope that it also instils some healthy sense of competition among the IndiBlogging community. Who knows, may be some kind corporate soul may notice and start sponsoring this effort in future. Watch out for further announcements on the awards, the methodology, the rules and when would they be announced. Meanwhile, your comments and suggestions may be posted here or mailed to us at indibloggies at myway dot com.